Big data: Bold promise? Or the hardest part of population health, precision medicine and better patient experience? Leading providers are already thinking about how to transform themselves from data-driven to information-driven organizations, able to offer drastically improved patient experience akin to Amazon and Google. But it's not easy. Seattle Children's Chief Data Officer Eugene Kolker offered up a confession: "I'm a little bit nervous right now about what's happening in our industry. People are moving from one extreme to another." His main concern? Healthcare providers and payers that are focusing on cost above all else. With changing payment models, shared savings and risk and patients empowered by everyday technologies, Kolker said, this new age requires providers to concentrate on so much more than the bottom line. "We have to drastically improve experience for our customers,” he added. “In the next five years we'll have really different customers. They'll have a Google- or Amazon-like experience to compare providers by outcomes and expense, and they'll be able to do that conveniently with phones they have right now." Addressing that demand is going to require putting big data and analytics to work in new ways — and leading health institutions are already thinking about how to transform data into information. In addition to Seattle Children’s, some of the first-movers include Advocate Healthcare and Brigham and Women’s. Despite all the buzz around big data, a smaller reality persists. "I haven’t seen healthcare big data. I've only seen healthcare little data," said Sriram Vishwanath (pictured above), a professor of electrical and computer engineering at the University of Texas, Austin. "Healthcare data science is fundamentally different than every other domain. Healthcare is exponentially harder." 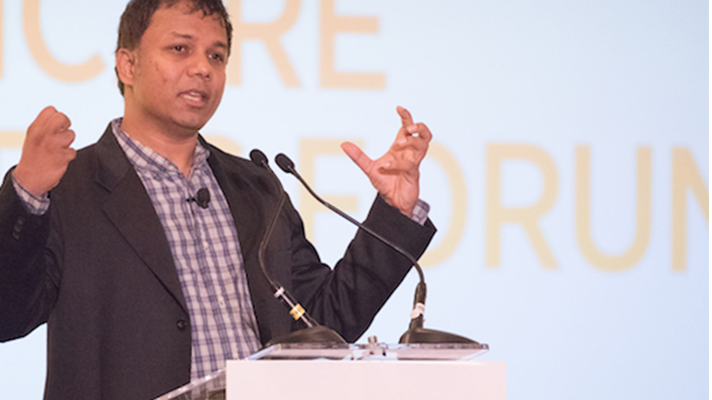 One reason: Within a population of tens of millions of patients, Vishwanath explained, it's typical that only a few hundred thousand are ultimately driving cost and treatment patterns. What's more, privacy concerns are inhibiting healthcare organizations from easily linking information to patients, according to Kenneth Mandl, MD, a professor of Pediatrics at Harvard Medical School and the Boston Children's Hospital Chair in Biomedical Informatics and Population Health. "There's a reason we don't have much data linked to the patient: privacy," Mandl added. "One issue in healthcare is that the data doesn't link very easily." Those are among the reasons that, according to Deloitte, only 16 percent of healthcare organizations are doing anything beyond dabbling — some analytics pilots, perhaps, or proofs-of-concept. "Most organizations are only able to tap into retrospective views; they're not ready to use analytics to provide more advanced insights into the business," said Ryan Renner, principal of Deloitte's Strategy and Operations analytics leader. The difference between data and information is more than a nuance or naming convention. And with population health, genomics, precision medicine all on the horizon, there are some emerging success stories of providers running analytics against data sets to glean actionable information. David Bates, MD, chief innovation officer at Brigham and Women's, for instance, rattled off high-cost patients, readmissions, triage, decompensation, adverse events, diseases that affect multiple organ systems as areas where he has already seen early demonstrable progress. "It's not just about the data — data is not the most key aspect anymore," said Tina Esposito, vice president of the Center of Health Information Services at Advocate Healthcare. "It's how you turn it into information." Taking that a step further, Chris Keaton, director of information and analytical advancement at HealthNow New York, said his intention is no longer to be a data-driven organization. "I want to strive to be an information-driven organization. That's my goal," Keaton explained. To which Seattle Children's Kolker added: "We're trying to get from data to execution." Advocate's Esposito said that providers will be looking to explore ways of tying information together to better understand characteristics of patients and populations than we do today. "The number of data sources that could be pressed into use are huge," Mandl said. "There are ways to make big data sing and dance if we align with workflows." That won't be easy. As the digital world moves toward IDC's projected 44 zettabytes by 2020, in fact, the challenge of examining all that data is finding employees with the right skill sets, engaging leadership to ensure projects succeed, having clean processes to communicate with customers and having a tight, iterative development cycle, according to Jonathan Greenberg, director of Fast Analytics at the University of Michigan Health System. "Now a lot of data are collected electronically but it does take a lot of work to get all the data out the back – we’re working to make that a sustainable core feature of healthcare," Mandl explained. "We can get the data out now, and do studies at scale. But how do we influence at the point of care itself?"